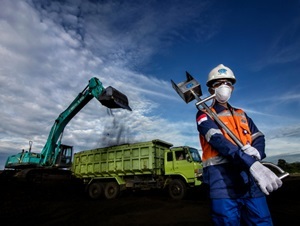 PT Surveyor Indonesia (Persero) – PTSI is a reputable state-owned independent assurance services company in Indonesia. Based in Jakarta, PTSI engaged in Surveying, Verification, Inspection, Certification and Consultancy. PTSI has its business activities focused in 2 business process: Business Process related to Operations and Business Process related to Corporate Policy Establishment. PTSI is a state-owned company and is majority owned by the Government of Indonesia. At present, PTSI is 85.12% owned by the Government of Indonesia, 10.40% by Societe Generale de Surveillance SA, and 4.48% remaining shares by PT SUCOFINDO (Persero). Concept, style, clothes, activity, color and typography adjusted to your signature style combined with the Company’s standard style. The Company’s standard style and references can be seen on the Company’s Instagram.